Degeneration of the discs particularly in the moving sections of the spine like the cervical and lumbar levels is a natural process of “aging.” When this “aging” process occurs more rapidly or prematurely it is considered “degeneration”. The dehydration or desiccation of the disc material reduces the flexibility and typically the height of the disc. In some cases, the degeneration causes pain from loss of disc height and abnormal motion or compression between the vertebra and causing pain. Cervical disc degenerative disorder can be characterized by neck pain. This neck pain can be most prevalent when the patient is upright or moving the head and can be reduced by lying down or reclining. Often the disc will be associated with osteophytes or bone spurs. They can further reduce movement and lead to nerve compression. The cervical nerve roots innervate the back of the head and neck as well as the arms and hands. If they are affected, the patient could have burning, tingling, numbness, and pain in these areas. Sometimes headaches result from cervical degenerative disc problems. 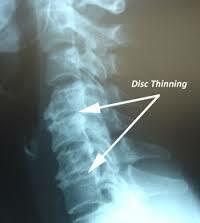 Cervical disc disorders if advanced enough are diagnosable on plain x-ray, which shows collapse or reduction in the height of the disc and possible bone spurs and bony end plate changes. An MRI is most useful diagnostic imaging for these conditions. The MRI shows if the disc is degenerated and best identifies the impingement on the nerves by bone or soft tissues surrounding thems. Changes in the bony end plates with increased water content in the bone are known as Modic changes. In patients with multiple degenerative discs and associated pain, it is often difficult to distinguish which disc or discs are the pain generators. In this circumstance, additional, more invasive types of testing may be required. They could include discography/CT, a technique of injecting the discs with dye and taking a CT scan in which the patient identifies the quality and severity of the pain in each individual disc tested. Another option might be epidural or nerve blocks that are used to determine the level that is causing the nerve symptoms.